This photo provided by General Motors Co. shows a Chevrolet Bolt, surrounded by nine electric and fuel cell vehicles covered by tarps. General Motors plans to go 100 percent electric, the Detroit automaker announced Monday. "General Motors believes in an all-electric future," said Executive Vice President Mark Reuss. "Although that future won't happen overnight, GM is committed to driving increased usage and acceptance of electric vehicles through no-compromise solutions that meet our customers' needs." A number of auto manufacturers have recently announced plans to "electrify" their product lines. But GM said its promise takes this commitment a step further, NBC News reported. 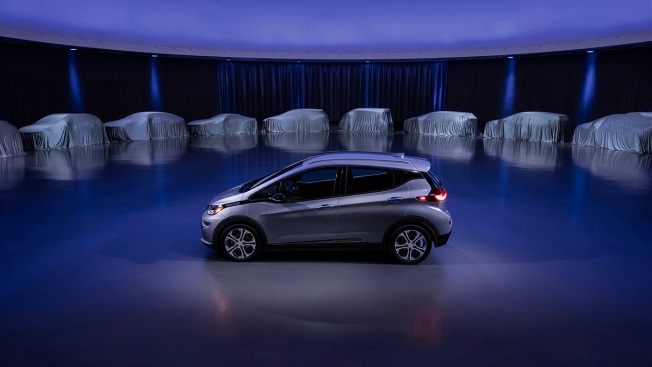 GM currently offers one extended-range electric vehicle, the Chevrolet Bolt EV, but will add two others within 18 months, Reuss said, with "at least 20" to be in the line-up by 2023.